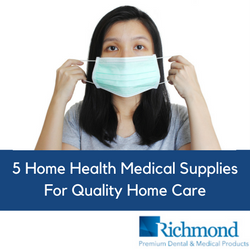 Richmond Dental & Medical has a lot of crossover medical products that could easily be used to provide quality home care. While most of our dental and medical supplies were designed specifically for those two uses, a handful of them would fit right into your first aid kit or medical drawer at home. Medical Balls: Our Medical Balls were made with doctors in mind, but if you look closely they resembled a household staple: the cotton ball. Soft and compact—and absorbent—our Medical Balls can be used to clean up cuts and scrapes (or to remove makeup and nail polish, too). It’s difficult to imagine a more versatile home health product. Cotton Tipped Applicator: With our Cotton Tipped Applicators, we basically built a better Q-Tip. Ours have a wooden handle, and feature 100% purified medical-grade cotton tips. Many use Q-Tips to clean the ear canal—though this can be unsafe—or as a tiny tool for household cleaning, as well as arts and crafts. We offer two lengths: 3” and 6”. Nonwoven Sponges: Much like our Medical Balls, our Nonwoven Sponges can be used to apply alcohol if you don’t have a cotton ball handy. In fact, Nonwoven Sponges can be paired with medical tape to create a do-it-yourself Band-Aid if you happened to be out. (Or, if you’re allergic to the adhesive used in Band-Aids as many people are, these could be used instead). You could also place a Nonwoven Sponge under a bandage to stop heavier bleeding. SteriPocket® Sponges: These come as an individual, pre-sterilized packet of two cotton-filled or Rayon/Poly nonwoven sponges. Designed for dental professionals to give to patients after an extraction, these would work perfect for quality home care or slip easily into a purse for when you need a sterilized gauze pad. Level I Earloop Face Mask: The last time you took a flight, you probably saw someone wearing a face mask. When someone is sick, or trying to avoid getting sick, a face mask can be a welcomed accessory. Ours are latex-free and offer full nose and mouth protection. If you’re under the weather and don’t want to get a loved one sick, having one at home can prove valuable. And, if you want even more protection, you can step up to our Level III version. Our Path-O-Guard face mask has a bacterial filtration efficiency of ≥98%. As you can see, there are plenty of dental and medical products that translate to quality home care. If you scanned through our products, we’re confident you’d probably find a few more that you wouldn’t mind having nearby when the time arises. If you’re using our products as standard home health medical supplies, always stock up before there’s an emergency. You’ll be able to provide appropriate care (maybe even self-care) when you need it.